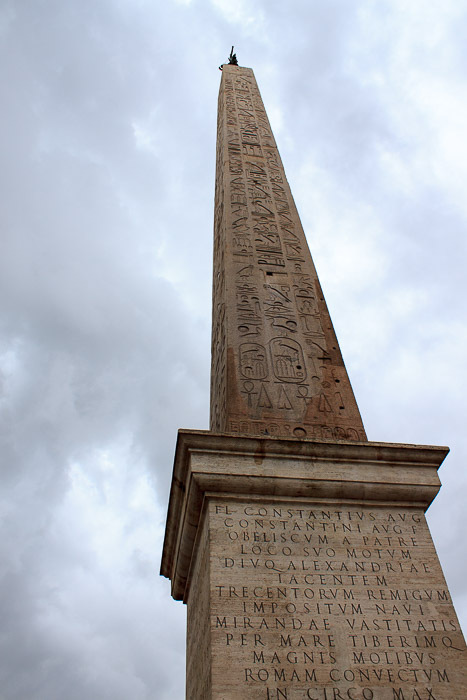 The Lateran Obelisk is the largest standing ancient Egyptian obelisk in the world, with a height of 105.6 feet (149.9 feet with base) and a weight of 455 tons. It's made of red granite, and it's surface is covered with hieroglyphics. Its inscriptions state that while it was begun during the reign of Tuthmosis III (1504-1450 BC), a great oppressor of the Hebrews in Egypy. It lay in the craftsmen's workshops for 35 years and was finally erected in about 1400 BC by his grandson Tuthmosis IV. It stood at the eastern end of the Temple of Amun Re in Karnak (Thebes), Egypt, but was removed under the orders of the Roman emperor Constantine (274-337 AD) who intended to erect it in his new capital of the Roman Empire at Constantinople. He died before the obelisk ever left Egypt, and his son and successor Constantius (317-361 AD) had it taken with the Obelisk of Theodosius (now in Istanbul) to Alexandria. From there it was brought on its own to Rome in 357 AD, where it was re-erected in the center of the spina of the Circus Maximus along with the Flaminian Obelisk at the eastern end. 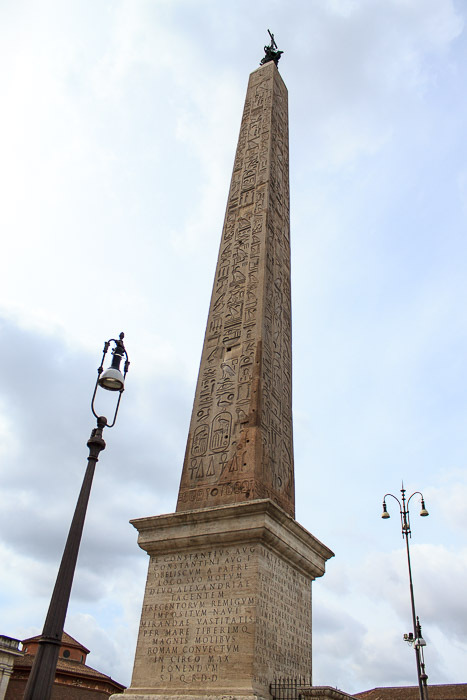 It was the last obelisk transported to Rome, although even Augustus (14-37 AD) had considered bringing it to Rome. 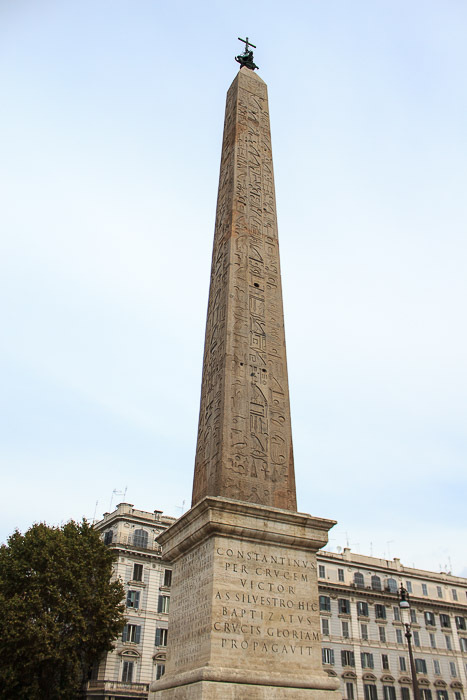 But although it is the last obelisk brought to Rome, it might be the oldest obelisk of all those in Rome, having been made in the 15th century BC (but the Vatican Obelisk might have been made in 1835 BC). 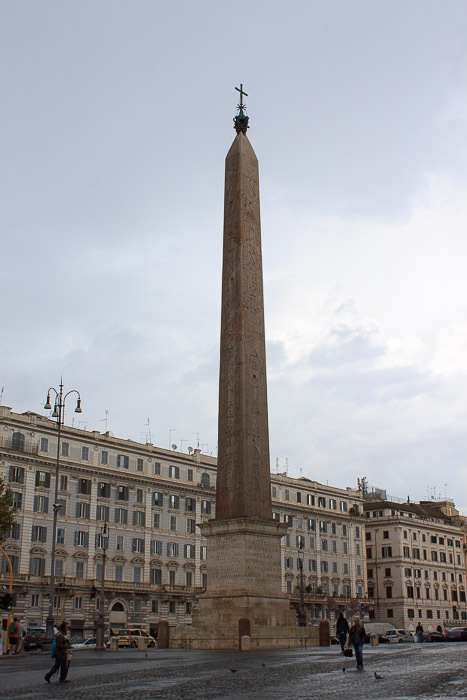 While St Peter saw the Vatican Obelisk now at St. Peter's Square, Moses may very well have seen this obelisk. At some unknown date and by some unknown cause, the obelisk fell. It was not until the 16th century that Pope Sixtus V ordered a search for the monolith. It was found, in three pieces, some 23 feet down in the former Circus Maximus. It was restored, about 4 meters shorter than it originally had been. On August 3, 1588, after more than a year of effort, the Lateran Obelisk was raised in the Piazza San Giovanni in Laterano, replacing the equestrian statue of Marcus Aurelius which stood there but was moved to the Campidoglio. Around the same time, the Fountain in Piazza San Giovanni was completed, mounted to the northern face of the base of the obelisk. The obelisk has stood there ever since, a Christian cross at its apex. 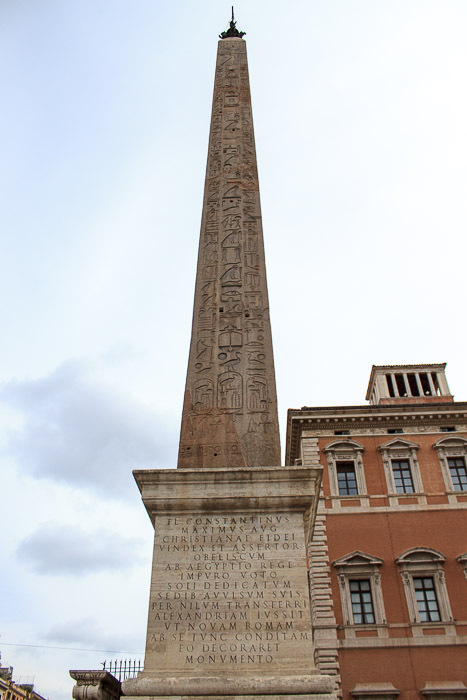 See all Lateran Obelisk photos. East side (2nd photo below): Constantius, champion and defender of the Christian faith, ordered the transfer of this biggest obelisk to Rome. 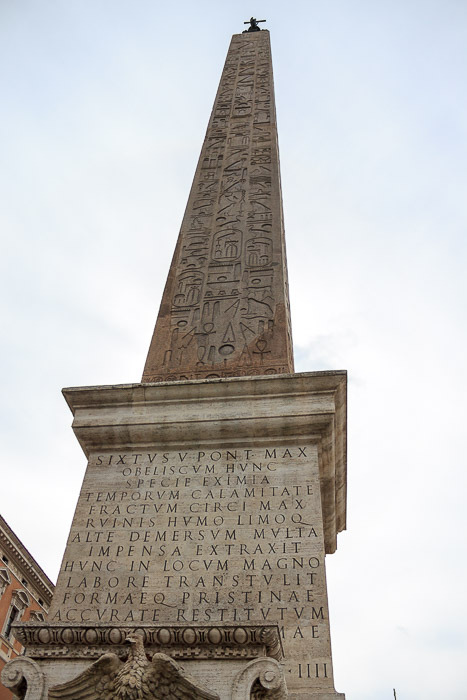 West side (4th photo below): The obelisk was moved to Alexandria by Constantine after sacrilegous dedication by the pharaoh to the god Sun in Egypt and transferred to the Circus Maximus in Rome by his son Constantius by means of a ship with 300 rowers. The hieroglyphics in the 3 columns of the four sides of the obelisk extoll the virtues of Tuthmosis III and Tuthmosis IV. For example, the central line on the north side says, "The Harmachis, the living Sun, the strong Bull beloved of the Sun, Lord of Diadems very terrible in all lands, the Golden Hawk the very powerful, the Smiter of the Libyans, the King of Ramenkheper, the son of AmenRa, of his loins, whom his mother Mut gave birth to in Asher, one flesh with him who created him, the Son of the Sun, Thothmes (III) the Uniter of Creation, beloved of AmenRa, Lord of the thrones of the Upper and Lower country, giver of life like the Sun for ever.". Wow, what a guy! If you're up for more, all the hieroglyphics are translated starting on page 127 of Egyptian Obelisks, by Henry H. Gorringe, 1885.